Mabamba wetland is a newly discovered home for the most sought birds the Shoebill hence a good destination for a 1 Day Shoebill birding in Mabamba Swamp. Here the 1 Day Shoebill birding in Mabamba Swamp tour is done on the canoes through marsh channels, other special birds to spot out on this 1 Day birding tour in Uganda at mabamba wetland include: White – winged Warbler, Papyrus Gonolek, Yellow-backed Weaver, Northern Brown – throated Weaver, Blue-headed Coucal and other swamp specialties. 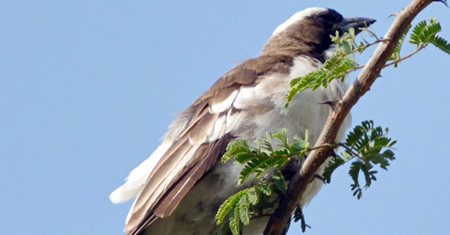 Encounter Uganda’s most birding destination as we visit Mabamba wetland system which is a Ramsar site and catchment area for lake Victoria located 55km away from Kampala city on the banks of lake Victoria covering an area of 2,424 hectares. The site supports an average of close to 190,000 birds. Mabamba wetland hosts a globally threatened papyrus yellow warbler, One of the world`s threatened bird Species the Shoebill is also found at Mabamba Ramsar Site. 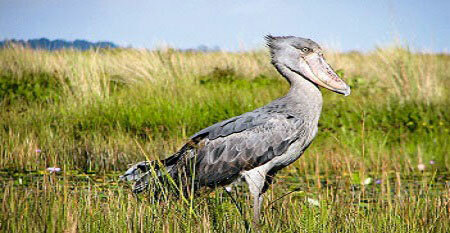 Mabamba Wetland is the only birding site close to Kampala city where one can find the globally threatened Shoebill (Balaeniceps rex), it also hosts approximately 38% of global population of the rare Blue swallow (Hurundo atroaerulea) hence creating room for short birding safaris in Uganda. Our 1 Day Shoebill birding in Mabamba Swamp starts with an early pick up from your hotels or place of residence and Leave for the swamp at 7am after breakfast driving about 55km west of Kampala city. The 1 Day Shoebill birding in Mabamba Swamp will enable you look out for shoebill Stork both in the sky and down on the marsh, the Swamp Flycatcher, African purple Swamp hen, African Water Rail, Common Moorhen, Lesser Jacana, African Pygmy Goose, White-faced Whistling-duck, Squacco Heron, Blue-breasted Bee-eater, Winding Cisticola, Goliath Heron and Black Crake. Our short birding safaris in Uganda is accompanied with a nature/cultural tour on the Nansubuga hill if time allows, the hill happens to be a Buganda kingdom cultural site belonging to one of the clans. It consists of tombs believed to be 600 years, rock board games and a scared forest. As we mark an end to our short birding safaris in Uganda, shall break off for lunch break snacks before returning to Kampala city as we drop you up to the pick up points hence putting an end to our short birding safaris in Uganda.